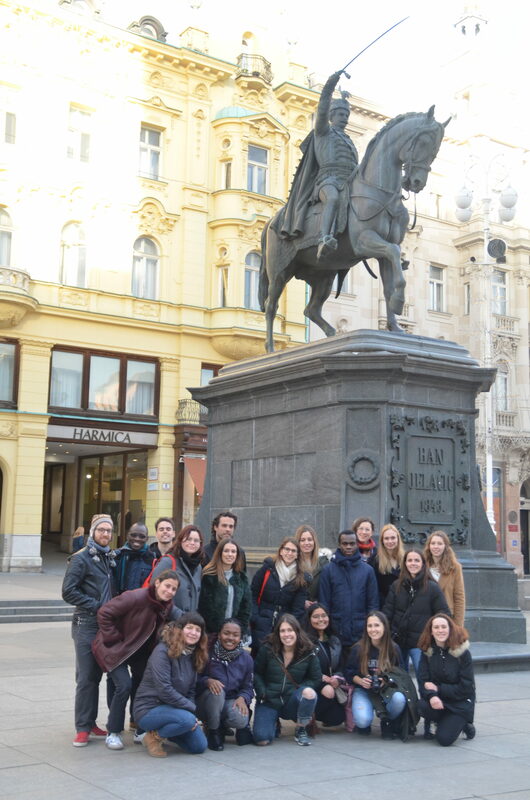 Last week, between the 14th and the 19th of January 2019, the Belgium team of the World Youth Alliance attended the Cultural Boat (CUB) Event in Zagreb. The Cultural Boat was organized by WYA Croatia and funded by the Erasmus+ project. Young people from five different European countries participated in the event (namely from Croatia, Belgium, Spain, Portugal and Austria). Altogether, more than thirty young leaders took part in the project and they all arrived with a strong desire to deeply understand human dignity and human rights. They worked together for a week and spent quality time during the project; therefore, they learned a lot one from the other. During the six days, the participants had to examine what it means to be a European citizen and how it is related to human dignity. Each day participants went through an intense learning process in new and creative ways, which made the workshops enjoyable. Everyone was able to participate in the workshops according to their abilities and strengths. Considering that participants had to work in teams, they were able to help and lift each other up. Through the workshops, all the participants got a comprehensive overview of the Certified Training Program‘s themes: human dignity, solidarity, freedom, and culture. The creative processing of topics helped the attendees to deepen their understanding. One of the main goals of the workshops was to get practical advice on how they can apply what they have learned to everyday life. Through the media workshop, participants studied how to manage images and videos in a creative way to mediate WYA’s messages for those who are not yet familiar with them. Through theatrical performances, participants experienced the importance of tolerance through their own skin. Finally, on quiz night, everyone had the opportunity to compare their knowledge about each other’s culture. In the evenings, unmissable cultural events took place. Each night, the participants of one of the countries had a specific thematic night where local dishes, drinks and sweets were tasted. These programs in the nights were an excellent opportunity to learn more about each other’s cultures. The CUB event allowed a deeper understanding of social and individual responsibilities, and the importance of each individual’s values. In addition, they gained practical knowledge on topics as the use of a true freedom, solidarity and tolerance. All participants improved their communication skills in foreign language, gained problem-solving abilities and improved digital competences. Above all, everyone made unforgettable memories. Written by Barbara Thamó, a Batch 1 intern at the WYA Europe office in Brussels. Human Rights and Discrimination in the EU..What do you think Antigone?